During the month of October, we offered a promotional code in support of Breast Cancer Awareness month with 10% of the proceeds to go to breast cancer research. We are pleased to announce that we raised $7,405.39! This money has been donated to The Stefanie Spielman Fund for Breast Cancer Research, which is devoted to advancing research in breast cancer. We would like to thank all of our customers for making this possible. Nearly 1,300 of you used the code to support this great cause. Many of those orders were for breast cancer shirts, personalized with a name of a loved one. Thanks to you, we’re helping the fight against breast cancer. 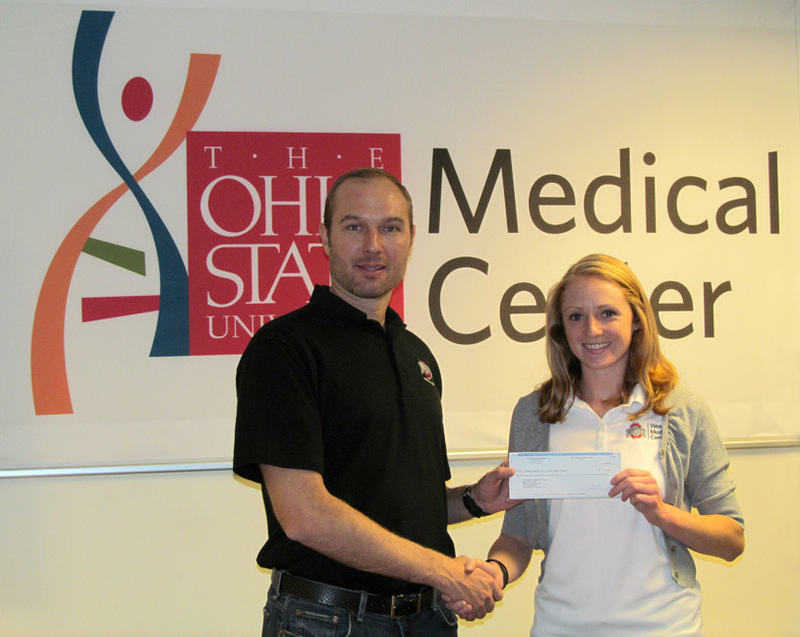 Our CEO, Taj Schaffnit, presents the check to Katie Brennan of The Stefanie Spielman Fund for Breast Cancer Research at The Ohio State University Wexner Medical Center. Great Job Customized!! Taj doing his part for Columbus, awesome dude, wonderful company!! Happy Holidays!